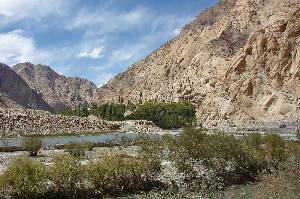 Our 2014 trip through Marka Valley was a full success, and so we decided again for Ladakh this year. This time we are heading further to the east. 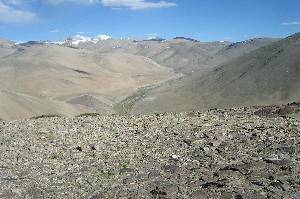 We expect a more copious landscape which is situated at a higher altitude. As usual, details about the organisation and the routes are given on a separate info page. Like last year, the first day is long and a bit strenuous. We fly from Friedrichshafen (the the airport is quite close to our home) to Frankfurt with Lufthansa and continue to Delhi in 7 1/2 hours, arriving there on Sunday night at half past midnight. The immigration form has become a lot easier to fill out, and the complicated customs declaration is no more necessary. Quite soon we also have our baggage. At the airport exit we are picked by by Sunny from our agency. The monsoon weather in Delhi immediately knocks us over: In the night we have 30°C, moisture 100%. Good that we can continue quickly: a short drive to the domestic airport. A big Swiss group is checking in their mountainbikes, so it takes a little until we can check in our baggage. Anyway, there's plenty of time. We have only to bridge two hours of waiting time in the "silent airport". No thougth about sleep, there are no loudspeaker announcements but again construction noise. Only Nina has a good place on her small mattress in between the chair rows and can sleep a little. Quite tired, at quarter to five we enter the plane which will bring us to Leh in about an hour. There are some clouds, and we find more snow on the mountains than last year. But maybe it will disappear again until we are on our trek. Breakfast in Yartsa Guesthouse, we meet again with guesthouse operator Diskit and her family. Then, eventually some hours of sleep. We visit the "town" only for diner in the evening. The first day at 3500 m altitude is strenuous. During breakfast, a plate of the ceiling cover is falling onto Henning's lap. A cat had somehow found its way into the intermediate shelf, now staring down onto us through the hole. Fortunately, nothing serious happened. 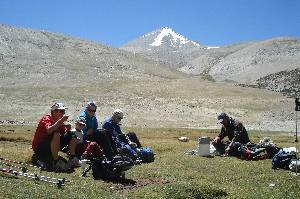 In the morning we discuss the trekking organisation in the office of Gesar Travel (e.g. choice of food for the trek); after that we have just a hike to Shanti Stupa, where we enjoy a nice view over the town. For diner, the restaurant had no beer also today. It is never indicated on the menu, but mostly it is available on request. But this restaurant seems to have no licence. 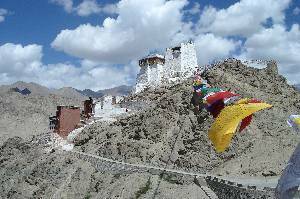 Again only a short walk in Leh: From the Royal Palace we go up the steep trail to the Gompa, which we don't visit very extensively this time. Descent on the back side on the paved trail and back to the center. 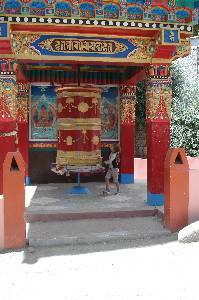 Some shopping; Nina buys prayer flags for the summit. Tonight there is beer again in the Penguin. So, the day before yesterday either it had run out, or it had been a prescribed day without meat and alcohol. 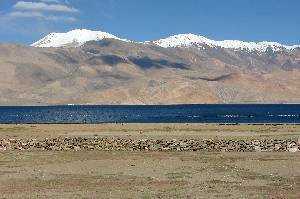 In two cars, we travel to Pangong Tso. 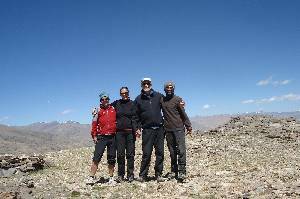 Our guide Tsewang Rigzin - who had accompanied us also last year through Marka Valley - is with us from today on. 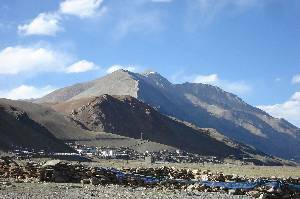 The drivers follow a narrow, but almost completely paved road through the valley of Chemre via 5370 m high Chang La, indicated as world's third highest motorable pass. Now the road goes down through mountains with scree in all possible variations of grey. Further up, some glacier mountains look inviting. 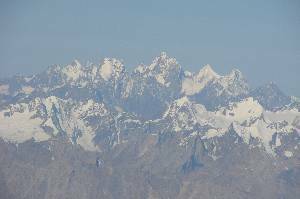 Very far in the background, we see brusque peaks of parts of the Karakoram. 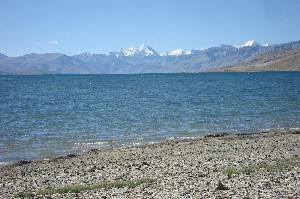 After six hours we see Pangong Tso, with a length of 134 km and a width of up to 8 km it has a similar size like Lake of Constance near our home. 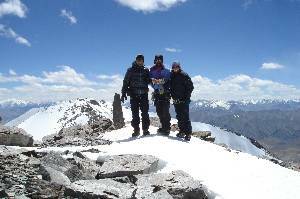 But the view is literally breathtaking: It is situated at 4260 m, and of course we are not at all acclimatized. 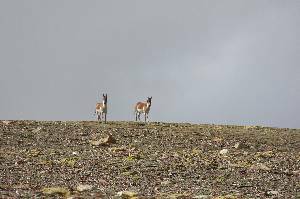 The last 6 to 7 kilometers from Spangmik to Maan, the road is only an indication of a jeep track through the scree. We move into our home for the next two nights in yurt-shaped tents with beds and even an individual toilet. Short investigation of the lake: It doesn't taste too salty, and the temperature allows to bath the feet for a few minutes. Dinner is very good, there is also European tasting pasta and even a dessert. Marion and Henning have a little trouble adapting their digestion to India, they are not very much interested in dinner tonight. After sunset it quickly becomes quite cold. 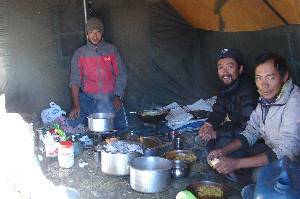 An unexpected surprise: After dinner we get hot-water bottles brought to our tents. After breakfast, we have an acclimatization walk on our schedule. 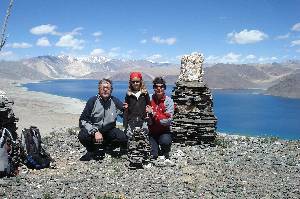 The hill above the village is about the only more or less independent elevation besides the rugged five and six thousanders of Pangong Range (for which no climbing permits are issued to foreigners). Everyone goes as far has he likes. 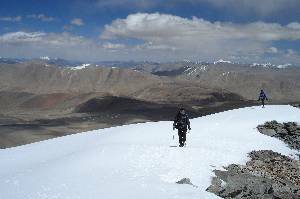 I go ahead with Rigzin and visit both summits (both are 4660 m high). 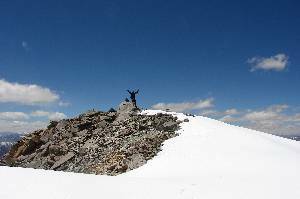 Claudia and Nina arrive on the western summit after 2 3/4 hours; Nina builds a nice little cairn. 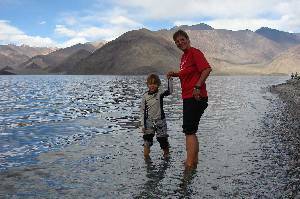 We leave Pangong Tso again. Near Spangmik, there is a nice view point at the lake shore. 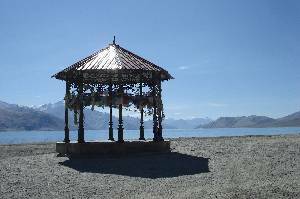 For the tourists from the Indian main land, this seems to be a modern pilgrimage destination because here the final scene of the very popular movie "Three Idiots" was produced. 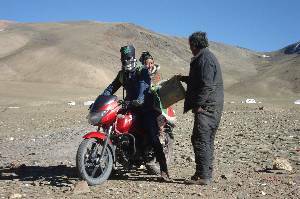 By this movie, Ladakh suddenly became known in the rest of India, causing a boom of Indian tourists. We continue back on the Chang La road which is in bad condition for quite a part of the distance. 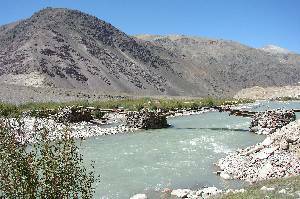 Near Karu, we reach the Manali-Leh Highway again and follow this road for 42 kilometers in direction Manali. Near Rumtse, there are already tents pitched for us on a campsite near the road. 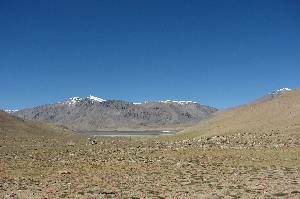 Altitude Höhe 4230 m. Although the majority of goods reach Ladakh by truck via the Manali-Leh Highway, traffic noise is not an issue. During the night there are almost no cars, we can sleep well. This time there are also no dogs which would howl at the full moon (what in other locations is a popular source of night entertainment to tired travelers). Today, Claudia is next for stomach problems. The big number of tourists leads to a big litter problem. 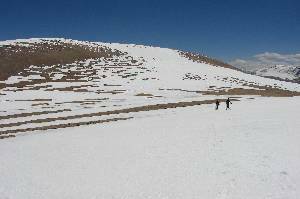 On a mostly very good road we cross Taglang La (world's second highest motorable pass, 5350 m) into a shallow high valley. 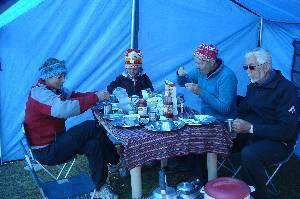 Short rest in a tea tent along the road. 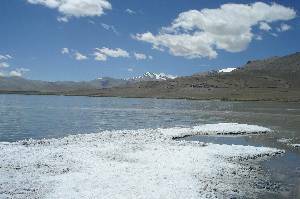 After a few kilometers, a rather bad cart track is leading towards Tsokar (White Lake). Inspection and taste test of the salt deposits; besides salt there are also a few sulfur crystals. 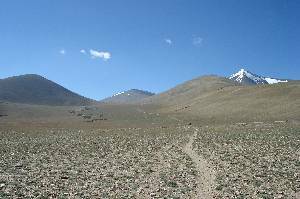 The track continues along the shore and through a desert-like plain until Nuruchang (4690 m) where our starting camp for the trekking is situated. Since we arrive already at noon, we have time for small afternoon hikes. Claudia, Nina, Marion, and Henning walk up the hill north of the camp; I go southwards, following sustained grass ridges to Horlam Kongka Ri (5215 m, according to the map 5180 m). When the sun has disappeared in the evening, it becomes cool quickly. For dinner, now long underwear is used. 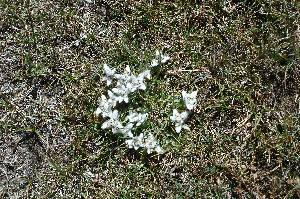 In the morning, tents and grass are covered with a little rime. 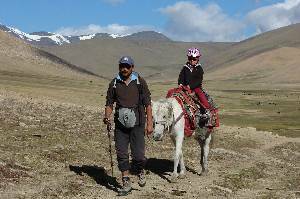 We had expected our pack horses here, but they are at Tsokar, 10 km north of us. 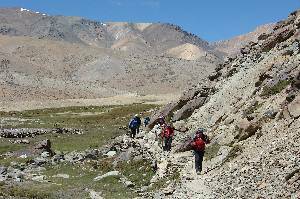 In fact that would have been the correct location: According to the trekking program the trek should have started there, so we find out looking at the schedule now. Anyway this day would have been a boring walk. 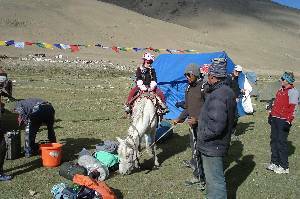 Rigzin is sending somebody to order the horses to Nuruchang, an we begin the trek with the second day of the schedule. 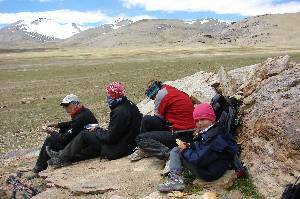 On the way to the Pass, Claudia, Marion, Henning, and Rigzin vitis Horlam Kongka Ri. Since the horses will come very late today, Nina has no riding horse today. But she beared up very well and covers all the 9 km distance on foot. 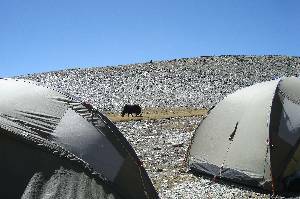 Especially the last 4 km after lunch break we have slow progress, the nomad tents just don't want to get nearer. 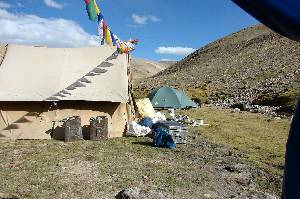 In Rajunkaru, the yearly visit of a lama of Korzok monastery takes place, therefore the whole population has assembled around one tent. We anyway have to wait for the horses, so we get some interesting views (thanks to Rigzin's translation) into the way of living of the Tibetan nomads. 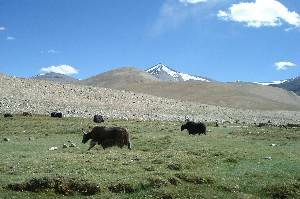 The older ones had escaped from Tibet to Ladakh some decades ago, and they use this area here with sheep, goats and yaks (dzos/dzomos). At half past four, eventually the luggage is coming. 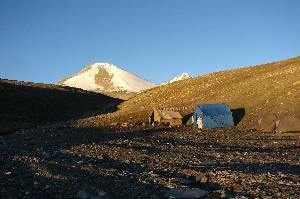 In record time the camp is erected, 4975 m. Around six p.m. the sun disappears behind the mountains, it becomes cold. 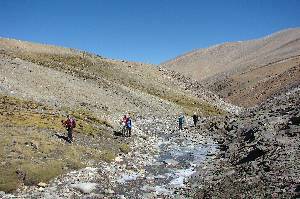 The trail to the pass is not steep. The nightly dogs' concert of Rajunkaru is absolutely equal to that of Leh. In addition to that, the dogs ran through our camp quite a few times. The morning is cold and windy. A layer of cirrostratus obscures the sun. We walk with long pants and gloves. 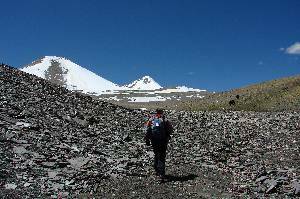 After about two kilometers we reach the pass Kyamayuri La (5430 m). Now it's only downward until the campsite, but the long distance takes another two hours. 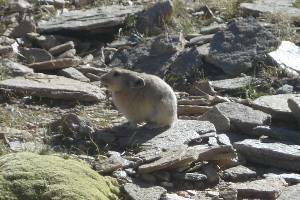 In the valley we see pikas (whistling hare) and kiangs (wild donkeys). 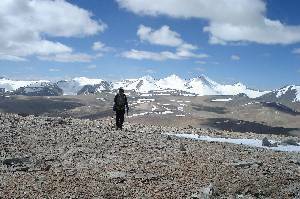 Above the hills, some summits of the Gyama Range come into view. One of our objectives, Yalung Nong, dominates the northern exit of the valley, being a massive, broad hump. 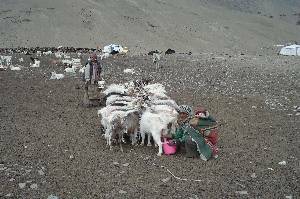 The camp Gyachung Karu is situated on a meadow at 5200 m.
The goats are tied together for milking. 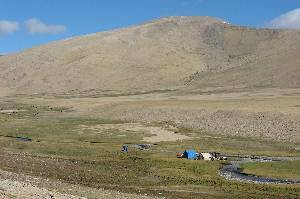 Our camp will be at the base of the small pass. With sun and without wind, the day begins much better than yesterday - although today not only the meadow, but also the tent was covered with rime. 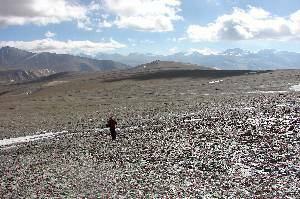 To Kostse La (5400 m) we ascend an hour, then the trail crosses the shallow valley of Gyama Sharma and Gyarma Logma, passing the right side of Yalung Nong towards the pass Yalung Nyau La. 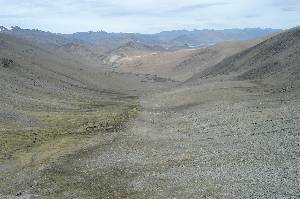 The trekking route to Tsomoriri would cross this pass. 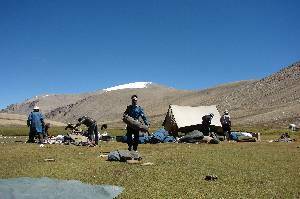 We stop at 5315 m Halt where our base camp is being set up in a small valley within and endless hilly landscape. 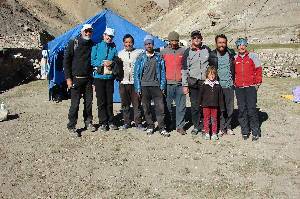 Claudia and I leave for Yalung Nong together with Rigzin; Nina stays in base camp with Marion and Henning. 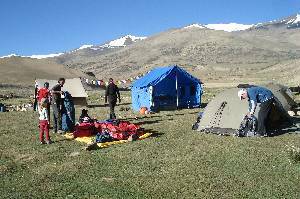 Unexpectedly, the sun reaches the camp as early as seven in the morning. So we can have breakfast in the sunshine, which makes the -5°C more bearable. 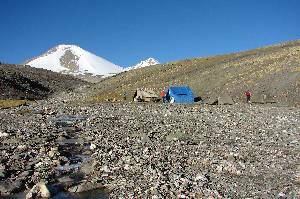 Also the slope above the camp is already sunny, and we notice that the long underwear is indispensable for dinner but out of place for the ascent. 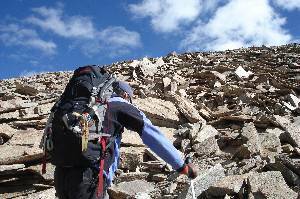 Rigzin leads us up a more or less steep, endless scree slope. 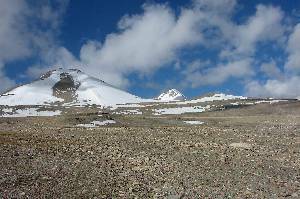 At 5900 m the terrain levels off, and we see a hill on the right side, and another hill further away on the left side. 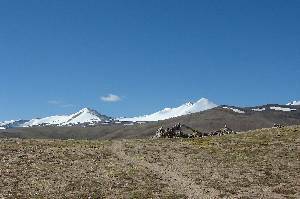 These are the two "summits" of Yalung Nong. Since I hadn't found a clear statement which is the higher one, we visit both. 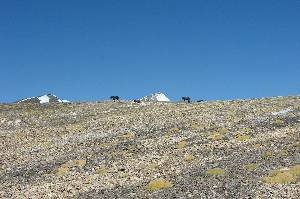 It turns out: The summit further away on the left side has an altitude of 6063 m, the nearer (southern) summit 6080 m. Between the two is a flat saddle at 5960 m. Both summits resemble kilometer-sized football fields cluttered with rocks. 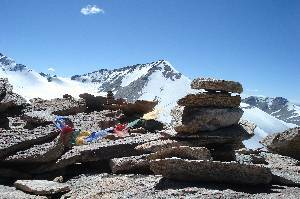 Probably the easiest 6000 m peak in the world. Probably also the most monotoneous, but the view is worth visiting. 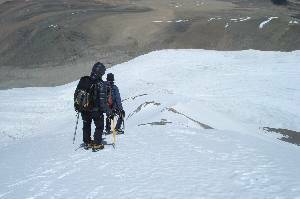 The descent is quick, at 2 p.m. we are back in base camp. 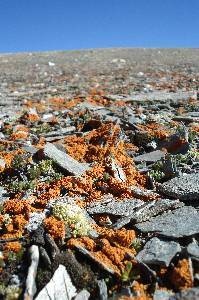 At about 5800 m we see the highest-growing flowers. 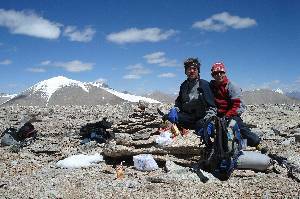 Today, Marion and Henning climb Yalung Nong with Rigzin; we have a rest day (i.e. child entertaining). The weather is not as good as yesterday, it is only partially sunny. 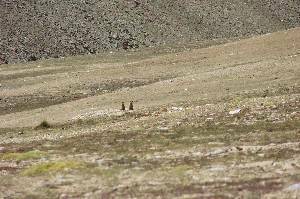 The three are back for lunch already; wind and snowfall had made the ascent rather tedious. Anyway they went at about the same pace as we did yesterday. Of course they omitted the lower northern summit because of unimportance. During the afternoon we explore the surroundings with Nina. Soon a small stream is found for playing, but botanically there is almost nothing going on. 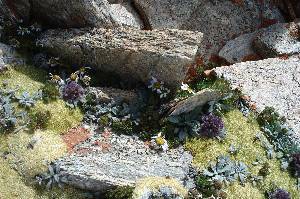 Besides cushion plants, there are only a few tiny flowers. 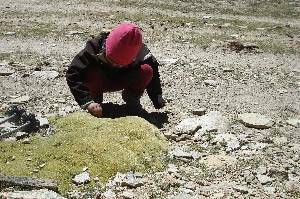 Yesterday afternoon, Rigzin had been looking for a new base camp site higher up which would be closer to the other mountains. 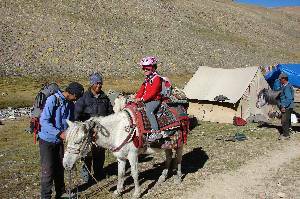 Today we move the camp there; the horses are coming up again from the meadows near Gyama. 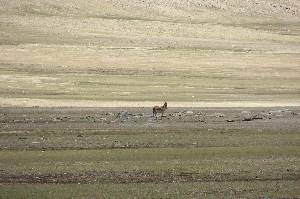 Later they will return there because at both base camp sites there is water, but not enough grass for horses. 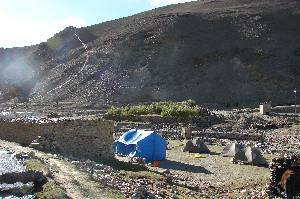 After 2 1/4 hours the new site of the advanced base camp (ABC) at 5548 m is reached. 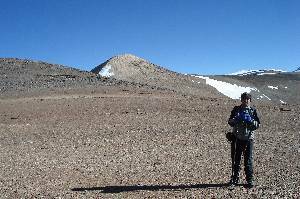 After lunch, Claudia and I continue upwards in order to investigate the interseting-looking mountain directly above. 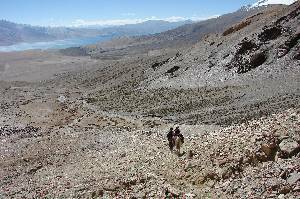 "Directly" is a relative term - first we walk through an only slightly rising scree plain, reaching the base of the mountain after an hour. 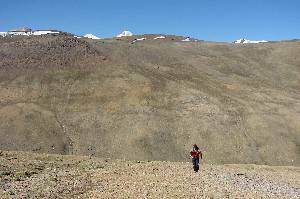 The left flank turns out to be a scree slope with three steeper rises. 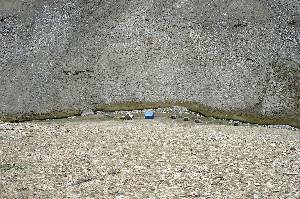 The scree is very loose, the route is not difficult but needs some care. The increasing wind doesn't make it easier. After 2 1/2 hours are on summit, being surprised by an outstanding panorama. 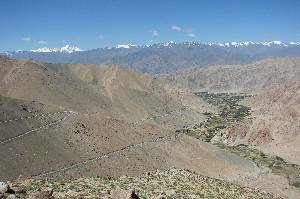 Directly opposite we see the higher mountains of the neightbour range, including the three probably highest peaks of the Gyama range. Ina larger distance we see Tsomoriri and behind the lake Chamser and Lungser Kangri (which are unfortunately closed for climbing since last year). From the larger distance, Yalung Nong evenually can be seen completely. On the western horizon we find the Kang Yatze group where we had been last year. According to the GPS, our mountain is quite exactly 6100 m high. 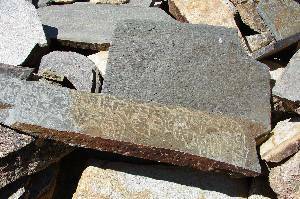 In the rocks near the prayer flags we find two business cards of Gesar Travel. We use one of them to note our names. 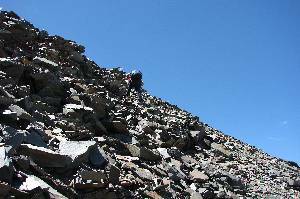 Carefully we climb down the fragile slope; the loose scree is better than expected. On time for tea at 4 p.m. we are back in ABC. The horses are ordered for Monday. 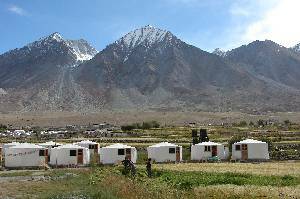 According to the schedule we could stay 6 days in base camp or ABC, but then we would have only a short overnight stop in Leh. Better we have a day in town and have one day less up here in ABC. It looks like we can do quite a lot of mountaineering here anyway. 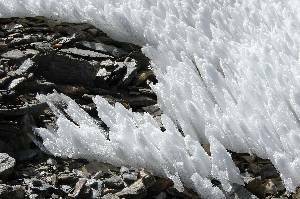 We follow the - partially frozen - stream upwards. 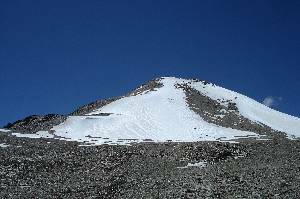 We soon will turn towards the left summit. The left ridge seems best suited. 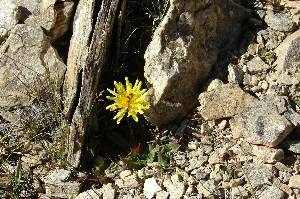 The loose rocks demand extra care. 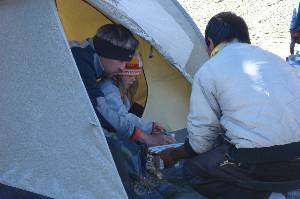 on the summit, 6100 m.
The night was colder than in base camp, but here the sun reaches the tent at six o'clock. Heute Marion, Henning and Rigzin go to P.6100. We have a walk around ABC, but Nina is not very enthusiastic about hiking. 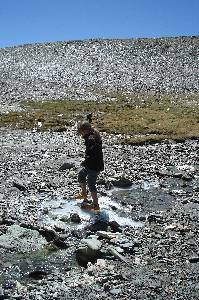 But she is keen on diverting the icy stream near ABC, standing in the water barefooted. 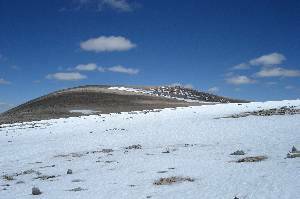 The three return successcully from the mountain at 2 p.m. The rest of the afternoon consists of recreation, but mostly within the tent - outside it is time and again windy and uncomfortable. This evening we observe a distinct degeneration of discipline: All of us go without teethbrushing, because with windy -3°C that is no more fun at all. Meanwhile also I take a hot-water bottle (a half liter PET bottle filled with hot water by the kitchen) for sleeping. Our last climbing day begins not very promising. Partly cloudy and very windy. 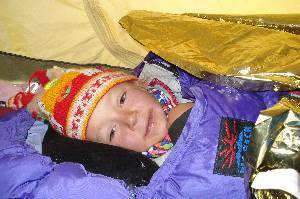 Nina, Marion and Henning will almost completely spend the day in ABC in the tent. 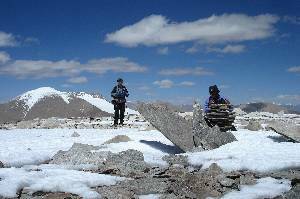 Claudia, Rigzin and I go to the nice pyramid-shaped mountain which can be seen from ABC on the right side of P. 6100. 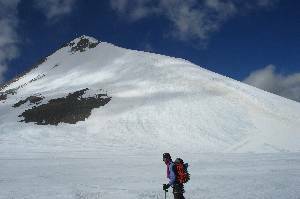 It sends a nice snow crest down towards us; from the saddle 5870 m finally we can see the complete ridge. In order to gain ist base, we have to give away 80 height meters. 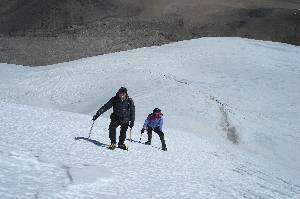 The glacier is free of crevasses, the ridge is mostly broad, with a steepness of 30-35°, sometimes a little more. Snow conditions are perfect, so we proceed well considering the altitude and the icy wind. 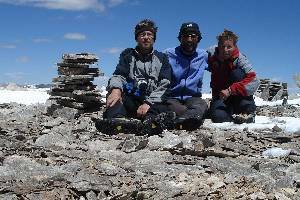 At 12:30 we are on the summit; according to GPS it has an altitude of 6293 m.
The thus far dominating clouds just now goes aside and gives way to the sun. 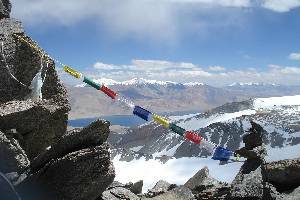 So we can comfortably take photographs, eat, and attach the prayer flags which Nina had bought in Leh for the summit. The vies is even a bit more gorgeous than from P.6100. 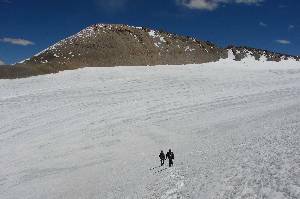 Although also from this point there are no 7000ers in view, the sheer number of summits around us is overwhelming. 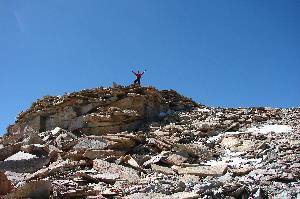 Surely a few hundred 6000ers out of which many hardly ever have been climbed. It feels cold again, we turn to the descent. It takes only half an hour down the ridge, but the way up to the pass takes the same time once more. 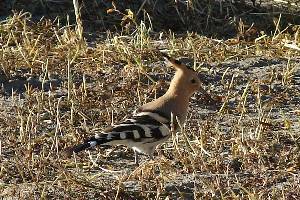 Then only the long, flat scree and sand fields, and we are back in ABC, being received by the kitchen staff with juice and soup. 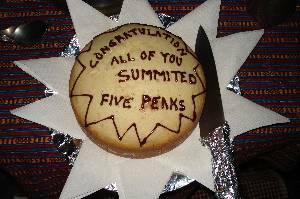 After dinner there is a cake, produced on the kerosene stove at 5548 meters altitude. The crest is easy, the snow is perfect. Our prayer flags find a nice place. It seems to become colder every day. This morning, shortly before sunrise, we have -11 degrees C under the awning. The wind has made the toilet tent almost collapse and uncoiled the toilet paper through the landscape. Also as we depart, it is sunny but windy and cold. Nobody wants to spend another day up here. 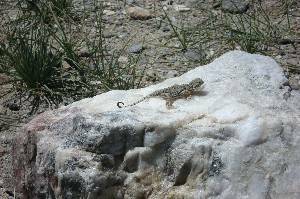 On the way to Yalung Nyau La, I find a sneaker (good condition, but unfortunately only one) and a pair of sunglasses (which Rigzin can use well) in the pathless scree plain. 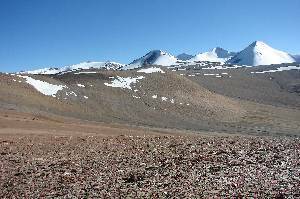 From the pass (5449 m) on, we follow a small, narrow valley down, with a view to Tsomoriri. 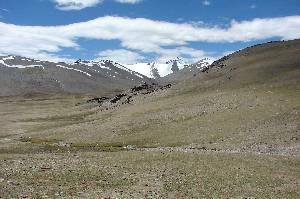 It soon widens to a desert-like plain which we cross for boring 4 kilometers. After another narrows we reach (4540 m), the largest (and, except for military bases, the only) village at Tsomoriri. A lot of construction work is going on: The road is being paved. We stay for the night on one of the campgrounds in the village. We conclude the trek with a short walk to the lake shore. Also Tsomoriri is not noticeably salty, and the water temperature is fresh but not daunting. 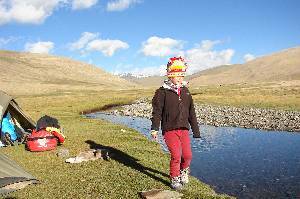 both more than 6600 meters high. Tsomoriri is the end of our trek. 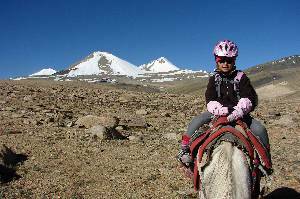 Yesterday Rigzin succeeded in getting a transport back to Leh for today. 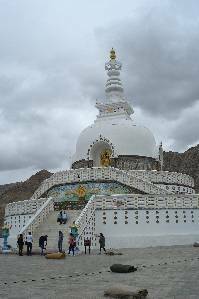 Actually we would have been scheduled for tomorrow, but that would have given us only a few hours in Leh before the flight back. Returning today makes it a bit more relaxed. After breakfast, distribution of tips and some clothing and gear to the staff, we begin our way to Leh in a minibus. 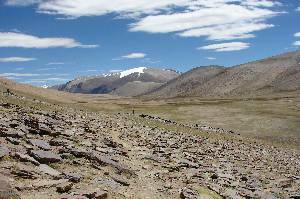 First northbound along Tsomoriri, crossing the small pass Pass Nusgur La (4830 m) into Raldong valley. 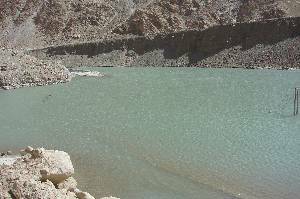 The landscape is changing from desert-like high plain to an equally desert-like river gorge - only along the river a few tamarisk trees are growing. 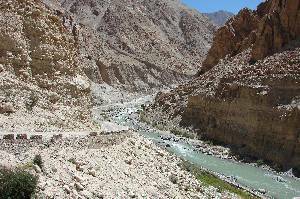 The first part of the road is a bad cart track, the rest is mostly paved and quite ok. After two hours (54 km), we meet the Indus River coming from the right, the road is now really good. 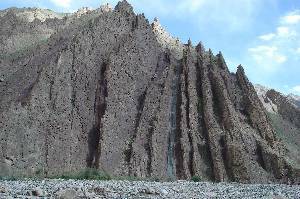 For 110 km we follow Indus downwards in a magnificient gorge with rock formations worth viewing. Again and again we encounter bad stretches where the road was only prosivionally repaired from the damages of severe weather in beginning of August. 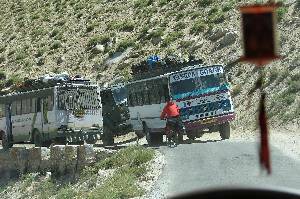 After we joined the Manali-Leh Highway, the road even has a complete lane for each direction, giving enough space to oncoming traffic. 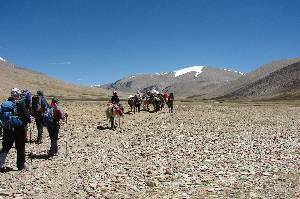 The final 50 km to Leh are done quickly. 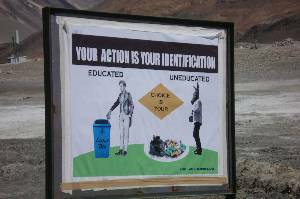 Though being quite small, the town of Leh means a big change. Noise, traffic and rush were absent for us during the last two weeks. We easily had adapted to this comfortable situation, but now even the noise of the small town is too much. In the evening, for the first time the restaurant waiter unpromptedly mentions that beer is available. Regrettably, this was the only positive about this restaurant. Waiting time and food quality made us assess this establishment as a non-recurring experiment. 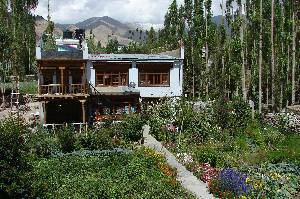 Time to sleep well and do some shopping in Leh. Furtunately not so very early: At half past six we are ready for the transfer to the airport. 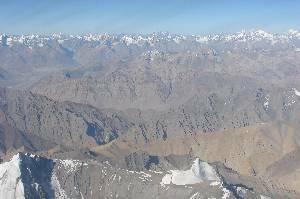 The flight is starting on schedule at half past eight, and in the beautiful weather there is plenty of mountains to marvel at. In Delhi it is warm and sunny. Most of the day we spend in the climatized guesthouse, until we are brought to the airport at 11 p.m.
Departure 2:35 means, that nobody really had some sleep before. Another two hours before dinner was served in the plane; the remaining five hours until Frankfurt one can only nod off a little. As a child even less, since fist of all the entertainment program must be consumed as much as possible. We arrive tired in Frankfurt, having only 1:20 to change to the domestic flight. Fortunately the baggage is already checked to the final destination, but still time is scarce. Security check is very accurate here. The bus to the plane is patiently waiting, we all come along and are back in Friedrichshafen on Friday morning at 10 a.m.
After clicking onto an image, a larger version (height 768 pixels) will be opened in a new tab in the browser. If you don't like the image height 768 (e.g. on notebook or netbook computers): Normally you can change the scaling of the contents using Ctrl-"+" oder Ctrl-"-".